“Why on earth not?” I believe was the approximate response from my photographer, Suzi Hathaway, of Suzi Hathaway Photography in Meridian, Idaho. And just why was this a subject? Two something-something females shooting photos for a cookbook? Why were they suddenly talking about frappuccinos? Who knows, except to say: pregnant photographer; self-proclaimed coffee addict away from her rural home and in the big city for two weeks. So I did. I don’t know why I thought it had to include toasted coconut. Something Suzi said? Maybe. She said lots during those days and weeks of cooking and shooting photos that made my creative wheels spin. And to watch her? Like a Picasso, a Kahlo, a Cassatt. I got the impression that she was not shooting photos, but the life and vitality in the foods in front of her. That she was shooting still lifes, not recipes. None of the sprays and shellacs that food photography is so famous for. Just good, organic and local ingredients, good light, and a very, very elegant eye. So, I got busy with toasted coconut. Suzi found some coconut flavoring in her cupboard (she does most of her work from her home), and we were off and gone. To toast coconut, grate fresh coconut and dry in the oven at 200 degrees. Once dry, toast in the oven at 275 degrees until light brown. Combine warm coffee, coconut sugar, and chocolate in blender and process on high for several minutes. Add both extracts, coconut milk, and sea salt and blend for several more minutes. Crush ice and add to blender, then use the whip feature to process for 3‒5 minutes. 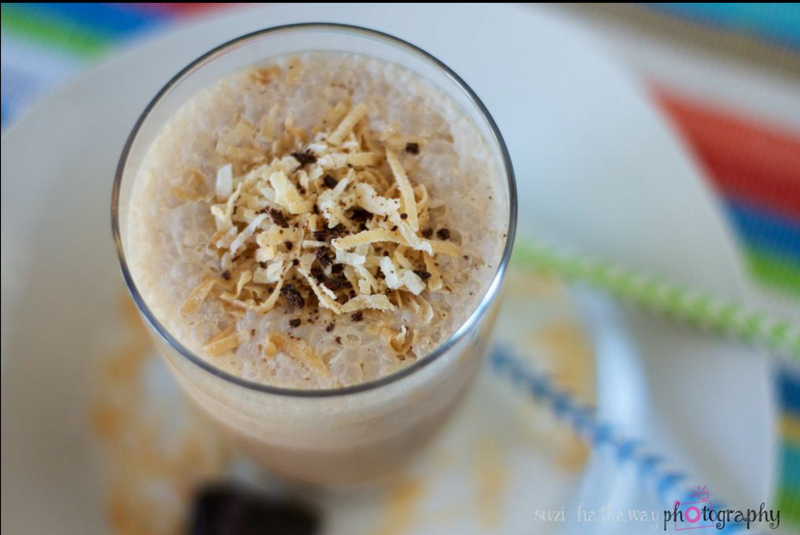 Garnish with toasted coconut and grated chocolate. Serve immediately. Makes 2 servings.